Business seems to come back to relationships over and over again, doesn't it? That's exactly how we felt as when introduced to Patrick, CEO and Founder of DogTelligent by a mutual friend. Patrick's company has been in the Grand Rapids area as part of the Seamless Accelerator program. Over the past 12 months his Connected Collar has gone from a fully funded idea on Indiegogo to having a working prototype that can now show dog lovers what it's like to have a device for their pet. As Patrick and I spoke over the phone, he talked about wanting to have a lifestyle session that would show off what it will be like to be the owner of a Connected Collar. As the conversation was happening in early June, I suggested a beach session that could help him take advantage of the Michigan weather, the summer months still to come and the fact that everyone between 4th of July and Labor Day is around water in some way shape or form (regardless of location). We talked about what he was looking for and the style he wanted to convey in the session. This lead to an editorial type session held at the Kruse Park Dog Beach in Muskegon. In addition, since pet photography is not my area of expertise, I called on Jennifer Waters of Grumpy Pups Pet Photography. Jennifer's experience with pet photography in West Michigan probably surpasses anyone you will meet and her images speak for themselves. All of a sudden the project became a collaborative effort between Patrick, the Founder and marketing mind behind DogTelligent, Jennifer, the resident pet photography expert and myself. 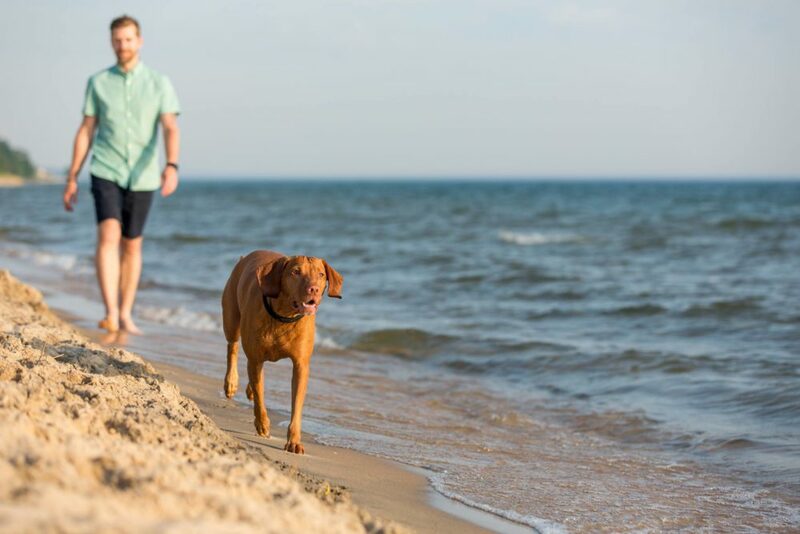 We spent just over an hour on the Kruse Park Dog Beach in Muskegon with Patrick and his co-founder Riley, who you will meet below. Patrick now has images he can use for PR and marketing needs. The most immediate need was for the Seamless Accelerator Demo Day, which gave him the chance to pitch his Connected Collar to investors from across the Midwest. Through his participation in the Seamless Accelerator Program, he will be back in Michigan this fall, working with the Holland Police K-9 unit as he creates a specific collar to help law enforcement units perform better with their animals. If you're interested in checking out or ordering the DogTelligent Connected Collar, be sure to click through and learn more. Or if you're interested in a photo session with your pet(s), Jennifer is the person to contact at Grumpy Pups. Be sure to let her know I sent you! Meet Riley, the Co-Founder of DogTelligent!